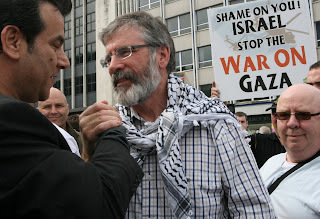 Regular readers will recall this blog’s meeting with Caoimhe Butterly of Free Gaza Movement. On May 17th I dedicated that blog to the story of the MV Rachel Corrie and the Flotilla to the Gaza Strip. I’m glad I did. But I never imagined what would happen to it. 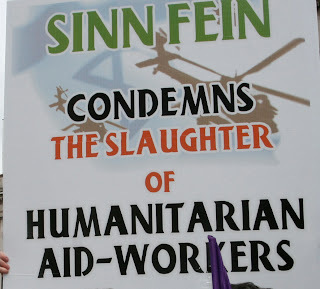 I was on my way to an early morning event in Tir Éoghan when the car radio broadcast the awful news of the death and destruction visited upon the mercy mission by the Israeli government. There is no justification for the military actions of the Israeli government against the humanitarian flotilla. The Gaza Freedom Flotilla is a humanitarian mission carrying 10,000 tonnes of aid to the besieged Gaza Strip. For four years the Israeli government has illegally imprisoned over one and a half million men, women, and children in the most horrendous of conditions. These people have been denied many of the basic necessities of life, including the essential construction equipment and materials that would allow Gazans to rebuild their shattered infrastructure. Last year’s devastating assault by the Israeli Army on the Gaza strip caused enormous damage. 1400 people were killed and many more grievously wounded. 3,500 homes were destroyed. 28,000 homes damaged. 800 industries were damaged or destroyed. 10 schools were destroyed and 204 were damaged. 57 kilometers of roads were destroyed. In April 2009 I visited the Gaza Strip. I saw for myself the conditions there. I spoke to UN officials, as well as representatives of political and community organisations and aid groups. No amount of PR words by the Israeli government can take away from the humanitarian crisis which its actions are directly responsible for. The flotilla organisers had repeatedly declared their peaceful intent. In the full glare of the international media the flotilla was engaged in bringing in humanitarian supplies. I believe it is this which the Israeli government resented most because it exposed the lie that they were allowing sufficient aid into the region. 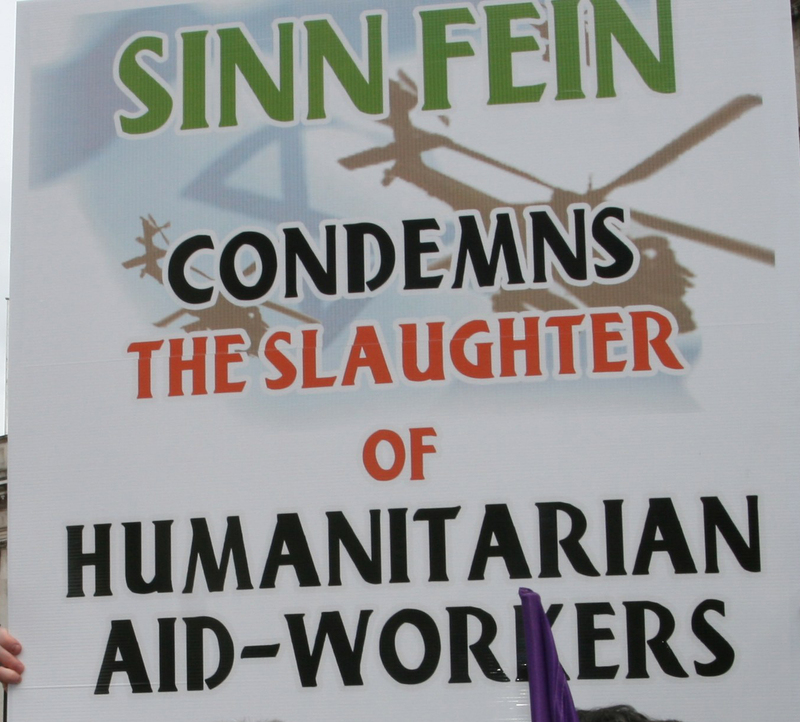 The images of armed commandos dropping from helicopters onto unarmed ships and then opening fire and killing aid workers engaged in a humanitarian effort, has again exposed the aggressive and intransigence attitude of the Israeli government. The decision to storm the ships is par for the course for a government that feels itself immune from international law and sanction. It also breaks international law by the blockade and siege of Gaza. It breaks international law in building a separation wall that scars the landscape of Palestine and which denies Palestinian families access to each other, to jobs, to their land and to water. It breaks international law in occupying Palestinian land. It breaks international law by building illegal settlements on stolen Palestinian land. It breaks international law by expelling families from their homes. It has done all of this for many years and with little adequate response from the international community. That has to change. In this instance the response of the international community must be firm and resolute. It must go beyond anger and calls for an investigation into what happened in the early hours of Monday morning. I welcome the fact that the Irish Foreign Minister Micheál Martin moved quickly to summon the Israeli ambassador. But he needs to go beyond this> he needs to ensure that the Rachel Corrie which lagged behind the flotilla because of engine trouble and thus escaped the IDF attack, is allowed to sail uninhibited into Gaza to unload is cargo of aid, especially the cement. The Israeli government has attempted to spin the story that the aid from the humanitarian ships should be docked in Israel and that the Israeli government would then deliver it to Gaza. The fact is that much of the humanitarian cargo aboard the Rachel Corrie and the other ships, including the cement, are prohibited under the Israeli blockade and would not reach those in need in Gaza. That is why the flotilla was put together in the first place. The Irish government also needs to use its influence to persuade the EU to discontinue its preferential trade agreement with Israel. As evidence of the outrage felt by citizens the Irish government should also expel the Israeli Ambassador. It is also vital that the Palestinian organisations now agree a government of national unity. Differences should be set aside in the national interest of the Palestinian people and a joint political position agreed between Fatah, Hamas and the many other political groups. Gerry I agree with you that the siege of Gaza should be lifted, but only as part of a comprehensive peace process, such as the one between the Irish and the British. Supplies going into Gaza have to be carefully searched because the threat of deadly warheads and lethal materials is very real. Quite apart from the often deplorable actions of the Israili Government, Anti-semitism levels are high again, particularly in Europe and throughout militant Islam. The Jews have got to be very careful with their security and watching out for the next Sadam Hussein. Look what he did to the kurds with that gas. Do you deny that some meglamaniac would not do something similar if given half a chance. What about the Mitchell principles. Have Hamas got these principles under consideration. Do we have to ask Iran and Syria for an answer to this question or can Hamas speak for itself. Can you find out if they would be prepared to sign up to the Mitchell principles. Be careful Gerry. Watch out for those anti-semetic scum who pretend to be all big hearted for the palistinians and disguise their hatred of the Jews that way. They hated Michael Collins and Bobby Sands too You know, at the time. when i heard the awful news my first thoughts were about your blog and yourself and martin mcguinness meeting with caoimhe butterly at stormont, and was she and SINN FEIN t.d aengus osnodaigh all right, notice that when todays irish news mentions aengus osnodaigh, they do not say that he is a SINN FEIN member, but they do give a lot of coverage to this outrageous event to be fair to them, i think that caoimhe butterly is still trying to get into gaza, you get to meet a lot of brave people gerry from all walks of life, good luck to the aid workers who are still alive, they will keep on helping the people of gaza in memory of those who were killed by the stormtroopers, and good luck to the palestinian people. This action was an absolute disgrace. As a Republican and a Socialist I condemn it in the strongest possible terms, terms that I cannot begin to put into words. I am seriously struggling to know where to start with this. And I've watched the situation on Ireland over the years. Let's recap: armed special forces troops staged a pre-dawn raid on an aid convoy that was in international waters. At least 10 are now dead, more are in prison and the ships themselves are in detention. Apparently the aid workers managed to seize the weapons of the IDF commandos in pitch black. And I'm capable of disarming the SAS. If you believe that, you'll believe anything. Gaza could probably count as the world's largest refugee camp. The UN itself states that the aid supplied to the area is only about 25% of what is needed. Gaza, the West Bank, the Golan Heights and East Jerusalem have been illegally occupied for over 40 years. Israel continues to allow illegal settlements in the occupied territories. It has now attacked an aid convoy, crewed by foreign nationals, in international waters in the dead of night. This quite possibly is a new low for a state that can be justifiably compared to that of Apartheid South Africa. I know this word is emotive, but I'll say it anyway. Especially as Israel and it's fanclub enjoy using it. This was an act of state-sanctioned terrorism. On the plus side, they seem to have pulled a rabbit out of the hat by getting Greece and Turkey to agree with each other. surely you know you've done something wrong when that happens? Thank you, Gerry, for having the nerve to speak the truth in such a clear way. I'd just like to know when those in good old blighty are going to do the same. Excuse me if I don't hold my breath. How can these atrocities be condoned/excused by anyone? We must continue in the quest to help the Palestinian people. Hhhmmm much like days in the past in Ireland. The aim was for 200,000. Over 216,00 have signed it in 2 days! !